What’s more fitting at an innovative toilet expo than, well, human stool? 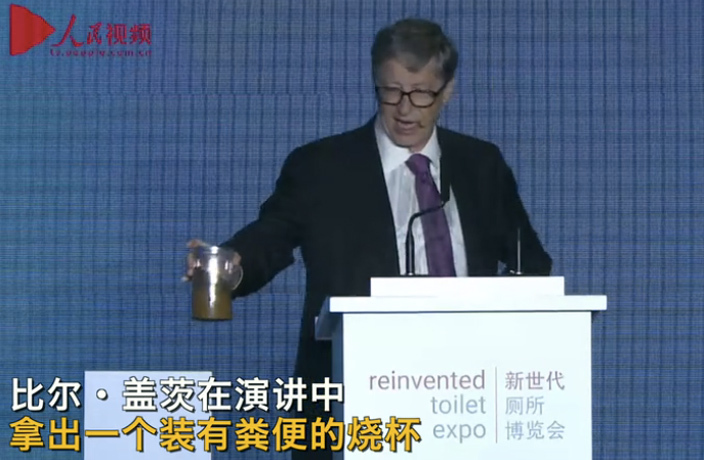 Bill Gates doubled down at the ‘Reinvented Toilet’ Expo in Beijing on Tuesday, November 6, producing a sample of feces to draw the crowd with disturbing facts about human waste. According to Associated Press, over 20 companies and institutions introduced their toilet tech in the capital city on Tuesday. The exhibitions displayed what the future of toilets and waste treatment could look like and how to address the sanitation problems facing billions of people around the world. Gates has developed a bit of a track record for putting himself out there. In January 2015, the billionaire activist was recorded drinking filtered water derived from human poop. In the video, Gates tells the audience that over 2.5 billion people don’t have access to safe sanitation. His foundation’s work has already improved the quality of life for millions of people in need. Soon, another notorious stretch of the Wall might be transformed into a more tourist-friendly sightseeing spot. As Beijing’s war on hospital scalpers continues, hospitals may have finally found a brand-new weapon to use against them. The city government just released a series of policies to protect gig-economy workers.